The World Mind Research Center* investigates natural patterns and structures found both in nature and the Bible. Its ultimate objective is to demonstrate that the Bible is as natural a phenomenon as the cosmos is and was formed by the same creative principles (Zechariah 8:23). The World-Mind hypothesis, as presented below, offers an explanation of origins that is respectfully alternative to both Darwinian Evolution Theory and Intelligent Design Theory. In order to cater to an as-broad-as-possible audience, this hypothesis is written deliberately in secular, non-Biblical idiom (1 Corinthians 9:22). *) Note that this particular World Mind project is not related to or named after any other project of the same or similar name. Also, the term "World Mind" does not refer to Gaia or related ideas but to the central hypothesis that the whole of human mentality is a closed and cyclic system, self-similar to the biosphere. The world-mind hypothesis proposes that the two realms of life (the biosphere) and reason (the mental sphere) are not simply two successive chapters in the grand story of evolution, but rather two self-similar continua that develop according to an underlying pattern. If the proposed self-similarity of the evolution of life and that of reason can indeed be shown to exist, it will disprove the classical hypothesis that evolution is merely driven by chance mutation and survival of the fittest, and aims for nothing. The logical conclusion of life-mind similarity is that evolution gravitates toward a previously established attractor (and an attractor is the point of maximum entropy at which a dynamic system must eventually settle). The fields of biology, psychology, sociology and economy should subsequently be found to be highly similar, and to operate by means of the same basic principles, and according to the same basic structures. This would in turn mean that these fields could be used to explain each other, and ultimately explain mankind's most intimate nature. It's the hope of the author that the world-mind hypothesis might prove portent enough to lead to a new chapter in psychology and psychotherapy: one based on mapping and maintaining mental ecosystems. According to the most dominant theories, life emerged when increasingly complex chemical compounds allowed spontaneous prokaryogenesis. Prokaryotes, such as bacteria, are the simplest form of life; single cells which contain little more than a DNA filled nucleoid (a nucleus without a nuclear membrane). During the prokaryotic era, earth's atmosphere was permeated with prokaryotic waste, which included oxygen and which in turn caused a genetic and behavioral reaction in the prokaryotes: they began to form complex colonies which in turn called for specialization. At some point, and for a thus far unidentified reason, one particular kind of prokaryote began to wholly absorb and adapt others (see discussions on symbiogenesis or endosymbiotic theory). The result was the eukaryote: a single cell that contained a nucleus fortified with a membrane, and several highly complex substructures such as mitochondria. These mitochondria retained their own prokaryotic DNA but were put to work as the eukaryote's powerhouses: they produce ATP, which is the internal energy currency of the eukaryote. This in turn allowed the eukaryote to develop into highly complex structures and ultimately allow multicellularity and the emergence of the large organisms we are and see around us. At some further point, and also for a thus far unidentified reason, one particular kind of large organism began to wholly absorb and adapt others: humans began to domesticate grasses into grain and animals such as wolves and wild ruminants into dogs and cattle. This achievement of our ancestors is truly mesmerizing; wild versions of potatoes and corn are inedible and even poisonous, yet people still somehow knew these plants could yield nutritious offspring, and patiently pried these out over the course of what must have been hundreds of generations. Animals such as cows and dogs stem from quite disagreeable feral forbears, and the vast majority of animals to choose from wouldn't yield tame offspring. But crucially, the concentrations of energy provided by agriculture and animal husbandry allowed societies to become much larger and complex and to federate with others into even larger economies. This in turn led to the formalizing of regulatory and criminal codes to be lodged at societies' cores. Modern humanity does not merely consist of humans, and simply would not exist in its present form without Homo sapiens' endosymbiosis with domesticable species. Modern humanity is the eukaryote of the mental world, and dogs and sheep are as human as mitochondria are eukaryotic. Ergo: at the heart of a herd the living was good. At first, man probably traveled with the herd, but at some point he must have began to try to control it. Some herds must have been easier to manipulate than others, and at some point we may imagine that a select group of strong young men were sent to the perimeter, while women, children and elders remained in the safe center. These strong men must have figured out that willingly sacrificing animals from the flock to predators kept unforeseen attacks and thus chaos and stampedes to a minimum, and that in turn led to a symbiotic relationship with the most susceptible of wolves and felidae, which in turn led to the genesis of dogs and cats. The obvious next step was the building of fences to keep the herd captured, and the building of houses within the herd. Feces may have a bad rap in our hygienic world, but at the economic level a steamy, nitrogen and energy rich, seed-carrying cow-flop is a true godsend. The resources that a company such as Microsoft takes in serve mainly to keep the company going, whereas producing products is a mere pleasant side effect. Still, if a herd of wildebeests would graze a savannah clear without submitting manure in return, the savannah and hence the herds would disappear within a season. Note that complex animals are in fact closely knit colonies of single cellular beings and in essence stay true to the eukaryotic principle of endosymbiosis. We humans tend to be proud of our individual personality, but what mystic traditions may call "soul" extends only through about 10% of the cells that form us; namely the 10% with the same DNA. The rest of the corporate bulk, without which we could not possibly exist, has its own DNA (and "soul" if you will). Why is there life instead of a linear descent from minimum to maximum entropy in the expanding universe? Most mass in the universe is retained in stars and black holes. Since massive objects don't simply hang in space but form the space around them (see discussions on general relativity theory), stars are not simply little points of light against a vast dark and empty expanse, but rather the nodes of the continuum that spacetime is. Every node has a massive object at its center and a "body" of curved spacetime (erase the star and the space disappears too). The characteristics of this body are wholly determined by the qualities of the nucleic mass, and the continuum is formed from the clustering of these nodes. In other words: black holes are structured and operate quite like living cells. These massive bodies rotate, and often as binary systems around common points of gravity. This causes spacetime to ripple with gravity waves. This results in a Chladni pattern that stretches through the whole of spacetime like a fishing net. Instead of the universe being an empty void, it's rather like a vibrating glob of frog spawn, sporting an ever-changing pattern of vibration that is determined by the distribution of energy in the universe. The crux of the matter is that this pattern carries information that describes the internal organization of the universe (a receiver could "read" this pattern and easily determine where the black holes are). Gravity waves are about the size of an atomic nucleus, so if this information has any effect, the effect would be somewhere on the atomic level. It's formally a mystery why and how the universe brought forth human consciousness, but the latter allows the contemplation of the internal organization of the universe, and is based on the organization of atoms into DNA. All this seems to suggest that the formation of DNA derives from the least resistance to a pattern-filled universe, and that genetic information derives from the pattern of distribution of energy in the universe. Since the universe expands, the average amplitude of this gravity net diminishes. That suggests that DNA only had a small window in time to form. (2) Why is there order on the way to disorder? In a closed system the total entropy must increase, but that obviously allows local pockets of order to emerge; as long as there are other pockets in which a level of chaos is achieved that is greater than the order of the ordered areas. That means that life may surely spontaneously emerge in the universe, as long as there are other local areas with an entropy that is much greater than the total entropy of the universe. So far these pockets of hyper-chaos that would allow life's spontaneous emergence haven't been identified, but that's maybe because prospectors have been looking in the wrong direction. 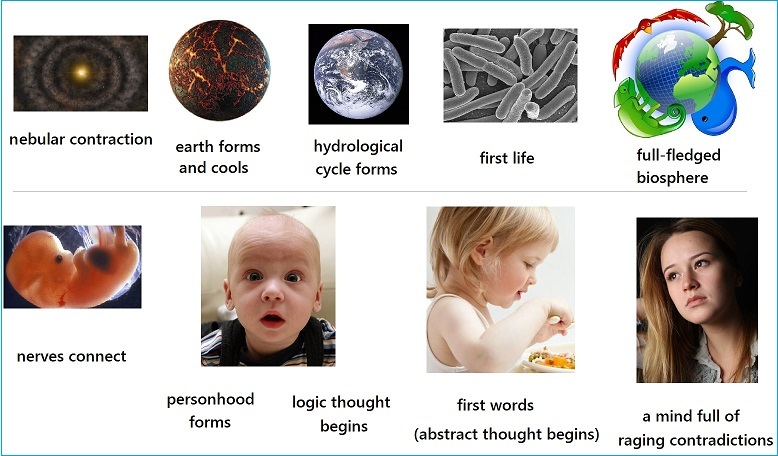 The world-mind hypothesis proposes that life and mind are self-similar, and their evolutions show the same basic shapes and forms. But this suggests that the "dimensions of the mind" are truly as much part of the universe as space and time are (and we should no longer speak of simply space-time but of space-time-mind). And that means that the universe is perfectly allowed to pay in chaos in the mental realm for the DNA-forming order in the material realm. To the universe, human social groups that have individual cultures and languages are precisely the same thing as objects (a situation of low entropy). These social groups reaching out and learning from each other is to the universe the same thing as specific objects disintegrating into formless dust (increasing entropy). The final result of a universal consensus equals ultimate entropy. Note that information is energy (see discussions on Entropy in Thermodynamics and Information Theory) and every individual human world view is hence a physical entity. It will take a while to work these suggestions out into proper math, but the world-mind hypothesis proposes that the entropy lost in the formation of DNA is less than the entropy gained by the formation of human consensus. The popular idea of the Big Bang suggests that the singularity from whence the universe sprang somehow suffered a cataclysmic malfunction and burst apart with the accidental happy ending of somehow turning into our world. The reality, however, is that the unity of the singularity was never compromised. The universe is still one. Evolution theorists, likewise, may be tempted to look at individual body plans, but individuals never exist in a contextual void. Preservation of oneness, whether of the biosphere or the mental sphere, determines the applicability of species, which in turn determines body plans. This is why isolated ecosystems such as that of Australia produce widely differing body plans that still preserve the unified working of the whole ecosystem. A beehive is part of a huge web of beehives, which are all part of the biosphere at large. One hive consists of many bees which consist of many cells. It doesn't matter at which level one looks, there are always "individuals," which exist solely on the merit of the continuum they comprise and our modern fascination with individuality is ludicrous. The success of an individual does not depend on the ability to compete, but rather the ability to comply. It's why we wear suits and ties: to demonstrate our willingness to be conventional long before our brilliantly creative uniqueness might make the tribe some money. Valuable differences can only be expressed atop a previously established convention. Like stars that consist of a massive core and the body of spacetime this core forms, so consists a "mind" of a conscious being and its world view (that is: the entire scope of what this being is conscious of). Inside a black hole, time stops, and that means that if the black hole were conscious, its instantaneous world view would consist of the entire evolution of the whole of spacetime, including the other black holes relative to its own position. Likewise one human mind is not simply that which sits inside somebody's head, but includes the minds of all other humans in its scope, relative to itself. Human economy is self-similar to the biosphere but since the biosphere is wholly integrated into planet earth, reason too should be expected to sit on a proto-reasonable mental skeleton, which in turn is self-similar to our planet. The transition between the most complicated forms of matter and the simplest forms of life is the same as the mind's transition into abstraction. This transition marked the beginning of the use of words (symbols) that represented real concepts. Abstraction (the rudiments of which are demonstrably shared with many higher animals) allowed for much greater complexity in thought and in turn literally changed people's minds. Prior to language, people as bright as we are today had the contemplative and conferential capacity of infants. Language only works when a sound means the same thing in separate minds. When proto-verbal expressions mean different things, entropy is high and nobody understands each other. When folks agree on the meaning of words, the entropy is low and folks can get along. When words are agreed on, folks can even step up and compare whole ideas, and so on. The scientific method, therefore, is not a tool to ease out some absolute Truth that Platonically exists apart from the universe, but rather a way for people to describe reality in such a way that we can all dig it, and so to raise the level of convention, and so to achieve more diversity. This same principle should be usable to explain bio-diversity. What does the polyglot say? Humans are nearly unique in the animal world in that they can imitate all other animal sounds. The transition into abstraction probably began when imitated animal sounds were used to indicate these animals, which then turned to names, which then turned to nouns, which then allowed other things to be referenced. Perhaps verbs arose when people began to modify nouns initially with other nouns -- perhaps two bear-like men were distinguished as Turtle-Bear (the slow one) and Deer-Bear (the fast one), upon which the ancient word for deer evolved into a verb meaning to be fast and the word for turtle became to be slow. When that eukaryotic language trick was discovered, language experienced its own Cambrian explosion, and the world of reason became the bustling economy of exchange we have today. Quite like sheep and dogs, proper languages were sculpted from their natural ancestor, and their natural ancestor was an intrinsic response to human DNA. DNA and human language are even so similar (see discussions on the applicability of Zipf's Law on DNA) that some enthusiasts imaged that our DNA comes encrypted with a telegram from a mindful creator, but the opposite is obviously true: human language is an expression of DNA just as much as our bodies are. Life and mind are both notoriously hard to define, but in order to have working definitions we propose that life is the ability to store energy chemically (rather than kinetically) and retrieve and convert it again, and that mind is the ability to store information and call upon that resource and respond to it in the same way as it would respond to an external stimulus. Obviously, both life and mind originate at the atomic level since atoms store both energy and information, but a proper life-form is a cluster of molecules that can contain chemical processes and retain energy without suffering spontaneous dissipation, and a true mind arises when two or more eukaryotes can retain and exchange information without suffering spontaneous data degradation. An object that absorbs light assumes the color of the wavelengths it rejects and a perfectly black object reflects no light at all and is therefore black. All non-living objects convert absorbed energy into kinetic energy and all objects radiate the energy they absorbed until they have the same temperature as the environment. A living creature, however, absorbs light and does not radiate it. It is therefore a transfinitively black object. Ergo: life is based on transfinite thermodynamics and mind is transfinite life. Our planet is commonly imaged to have formed from a hot and contracting dust cloud, and long before Homo sapiens arose, the mental world was precisely that: a mere hot cloud of animals with minds that had little ability to share information and thus cool off and lower the mental entropy. But as the universe had a chaos bill to pay, it may have somehow favored the construction of minds that would be able to lower the entropy. At the emergence of Homo sapiens, a mental planet began to solidify. Our mental world (which, we shall repeat, is the continuum formed by humans negotiating and agreeing) should be expected to sport two main habitats: sea and dry land, and both these habitats were formed long before humans began to talk in proper languages. It would, of course, be politically incorrect to speak of the better habitat, but since mind arose on land and reason pays the DNA bill, dry land is the very promised land the universe has life head for. And although most of earth's biomass comes as single cellular organisms and multicellulars such as ourselves are really just curious islands of oddity in the vast oceans of life, mind arose among the multicellulars, so multicellularity is preferred. All human languages on earth are indeed all derived from the same inherent proto-language: the human equivalent of a dog's bark and an owl's hoot (see discussions on Syntactic Theory). That suggests that dry land equals convention in its broadest sense: that which all humans agree on, long before they think about it in abstract terms. Most neurotypical people think nothing of it, but up until very recently, an inability to precisely mimic and reproduce common facial expressions and intonations in speech could earn someone the predicate of village idiot, even though this person might have an above average IQ (see for instance Carly Fleishmann's story). Dry land comes about from the working of tectonic plates, and water in all its forms sculpts land via erosion and sedimentation. If the mental equivalent of dry land is pre-reasonable convention, then water must represent some kind of convention altering experience. Life requires water in the same way its mental equivalent is needed for the mental sphere. It sometimes appears as snow and ice, collects in pools and falls out of the sky as rain, but it's always part of a largely closed hydrological cycle. All this suggests that the economy that today defines humanity is a mere segment of the much larger world of human mentality. Our world is an interlocked maze of acceptable and recognizable interactions, but outside this world exists a vast expanse in which human minds exist that are not standing on the dry land of human convention. In other words: autistic human minds might be understood as the whales and dolphins of the mental sphere. In that same vein, artists and such are like seals; as wholly comfortable ashore as in the water. Birds that take to the air may have their mental equivalent in human visionaries: people who routinely transcend the obvious and extend their scopes beyond the horizon of common grazers. Long before humans began to form abstractions and hence language and hence more complex ideas such as the domestication of fellow minds, the mental world consisted of a lifeless planet with a fully functioning hydrological cycle, weather and dry land. How or why it happened is still not clear but within that world, elements began to cluster into complex molecules and finally into the first fully autonomous living beings: the most rudimentary abstract ideas began their most rudimentary interactions, and slowly but surely began to turn their world into a blooming planet. It's not simply size that matters in the mental (or biological) world but rather cell type diversity: the more different cell types an organism has, the more complex it can be. The most obvious mental processes that are signature to modern human mentality can be most easily compared to the economy of the larger animals: herds of grazers versus prides of lions, examined from overhead by the occasional eagle. (All this is of course a polite way of saying that modern psychology, though much appreciated, still only regards the overly obvious and has not yet arrived at the level of mental germ theory). All complex animals apart from the aquatics have feet to stand on, but the front limbs of an animal tells much about its social character. The more complex and hand-like the fore limbs are, the more likely it is that the animal lives in a complex society, with many different social ranks. Humans, of course, have opposable thumbs and as such may create vast networks of interlocked minds. These are the people who operate in social realms that common folks can't possibly fathom; the economic geniuses who sketch entire worlds on napkins and then know all the right people to bring it about. But minds that are the mental equivalent of humans in the biosphere are as rare as humans used to be on earth. Most of us ordinary folks just plod along with the herd. Wildebeests stand on the ground of convention on all fours. They roam in enormous herds and their world view is almost wholly occupied by other wildebeests. Still, crucially, their herds have very little social stratification, and as long as the wildebeest's world view is filled with others from horizon to horizon, nobody cares how many there are and who belongs to who. Birds routinely take off from convention and take to the air. The mental equivalent of birds that live in vast colonies can be found in academies and universities. These bird-people often have a much wider scope than any human-human, but lack the social grasp to do much more than publish papers in obscure journals. Burrowers such as rabbits are specifically equipped to gain access to subterranean shelters. Their mental equivalents are folks who defend themselves by calling upon social convention at every turn; people who cry: "act normal!" or "that isn't right!" or "I was just minding my own business!" The fashion world, of course, depends heavily on burrowers and their tendency to hide deep within convention. There is no one-to-one correlation between biological creatures and their mental equivalents. A wildebeest can not exist on its own, and a mind that is wildebeest-like must per definition be like a small ecosystem peopled with multiple, interacting mental wildebeests. These mental entities, we might imagine, are based on the mental equivalent of biological DNA, which is perhaps some engaging concept or principle, or perhaps a traumatic memory or kind word spoken by someone in passing, which achieves autonomy and gathers mental biomass and begins to roam our mental world in various forms. Which experiences remain mere gusts of wind and which develop into autonomous mental creatures, which in turn might spawn vast collectives of offspring, may depend wholly on the susceptibility of one's mental ecosystem. To suggest an example: one youthful encounter with an ill-tempered white rabbit might spawn an autonomously roaming mental creature that avoids rodents and another one that avoids white things, and both might grow into vast herds of slightly varied grazers. If these grazers compete all other grazers off the mental savannah, the human host has developed an elaborate obsessive compulsive ecosystem and is probably going to require some help in restoring a healthy psycho-diversity within her own mind. Where larger creatures are concerned, the food chain begins with vegetation: common grasses, of which every blade is a virtual eukaryotic tower. Shrubs and trees are like grasses but have more cell types. And all their roots are in the ground. The mental equivalents of grasses are fleeting notions and chit-chatty observations, whereas trees are long established ideas such as traditions. Many people are grazers, who stroll on the dry land of human convention and collectively small talk their way to a healthy and well-nourished mind. Others dwell in the many forests of our modern world and feed on the fruits with which trees demonstrate their merit and have procured their perpetuity. Mental carnivores aren't interested in gleaning the verbal landscape for nutrition, but go after those that do. Just a few centuries ago a spectacular amount of mental energy was caught up in the simple proposition that one element could be turned into another one by uttering the right magic spell. By the time of Newton, this principle of alchemy was represented by a truly vast herd of grazers and birds, which wasted the mental energies of countless people. These monstrous beasts occupied academia and their lurid offspring peopled whole libraries, until Newton released upon them the blight of the scientific method, and left their corpses rotting on the plains. Other carnivores go after the beef. A starving author may eavesdrop on a conversation between strangers and appropriate their original statements. Whatever mental DNA caused these statements to emerge in the mind of the person who uttered them isn't important to the prowling author. All that is important is that the flesh (the actual statement) will serve to build up his own. It might be beneficial to engage in a discussion on whether it would be meritorious or desirable to routinely identify a person's mental species relative to the larger world-mind economy. A person who is mostly equipped to exist as a four-footed grazing herd animal should not try to be an eagle, and a lion-like person should not be forbidden to hunt for deer. But human park rangers might want to make sure that wildebeests don't overrun the flower beds or that lions don't go after the family cat. Some mental illnesses might possibly stem from an unbalanced ecosystem. If the critical review of some fertile event might alter the mental DNA of a huge swarm of locusts, their mental body mass needs to be reappropriated. Theoretical psychologist may want to consider using the tree of life supplied by evolution theorists in order to figure out which behaviors are genetically linked, and might show up to replace a defeated one. Is a person land-based or water-based? Is she winged and capable of flight? Is she by nature a carnivore, herbivore or omnivore? Does she have different or similar fore- and hind limbs? Is she naturally solitary (moose, rhino, polar bear), pack animal (wolf), or hyper social (deer)? A similar analysis could shed light on how the commodities market and economy works, and how companies relate to each other in a healthy and balanced way. Now that we might know why the universe produced life, we may also figure out which form of economy would be most according to natural law and hence sustainable en enjoyable for everybody on earth. The world-mind hypothesis was first proposed in the mid-nineties but the scale of its potential effects wasn't clear until recently. Today it's obvious that the matters proposed by this hypothesis merit a closer look by a wide array of scientists, and for that purpose we are in the process of assembling the World-Mind Research Center. It will take a wide range of scientific minds to flesh out the full range of the mind-world hypothesis -- we're confident that even the fields of anthropology and literature may contribute since many ancient systems of thought (including the Bible) used variations of this world-mind model. Our call today is for academics to go on record in support of the potential merit of this hypothesis and thus its research center (we're obviously not asking of anyone to state faith in the validity of the hypothesis, only whether its premise merits further academic effort). Our next step would be to introduce our hypothesis formally to academia, with the request for accommodation. Once established, the World-Mind Research Center aims to collect academic papers that are relevant our hypothesis and to publish original papers in established journals. Since the universe had an entropy bill to pay, it favored the evolution of information sensing and storing structures, hence the eye and the brain. What benefit hold visible light and audible frequencies over the rest of the electromagnetic and sound spectra? If human mentality forms a self-similarity of planet earth plus the biosphere, what is the mental equivalent of water and particularly the hydrological cycle? What is the mental equivalent of air? Do large aquatic mammals have a unique and vital function in the global ecosystem? Does this shed light on how non-autistics may understand the vital contribution to human mentality of autistics? If self-similarity is at work in these matters, can the individual's developmental psychology also be compared to a cooling and forming earth? If so, how close is the development of an individual on a par with the development of the species? Is Dissociative Identity Disorder comparable to the rifting and breaking up of Pangaea and hence the forming of wholly separate continents and thus ecosystems? If human-human minds experience the same kind of growth as bio-humans did, what would that mean to humanity at large and planet earth and the way it's managed? Might humanity's collective mind be home to a vast depository of mental energy comparable to earth's microscopical life? Is there a demonstrable correlation between the rough outline of the workings of a healthy company and the main elements of a large animal's vertical symmetry?